We often find ourselves designing and installing shutters for bay windows, this time it was a square shaped bay window in a child’s bedroom. Lewis travelled just down the road from us to Maidstone, Kent to take measurements for the design, working closely with the client to come up with the best looking solution which would fit the exact window sizing perfectly! We designed these shutters in a full height style ready for one of our Fitting Technicians Ben to install in the bedroom. They were created from our Sumatra Range which was required due to the panels needing to be wider than normal because the windows had bigger than usual panes. 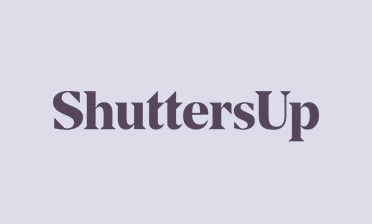 When designing our shutters we match the panels to the sizing of the windows so that they look perfect from inside the room and outside of the house! 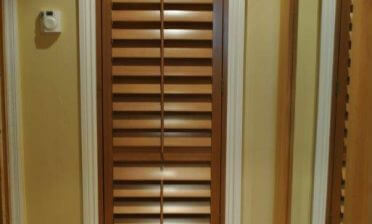 They feature 76mm louvres with centralised tilt rods on each panel. 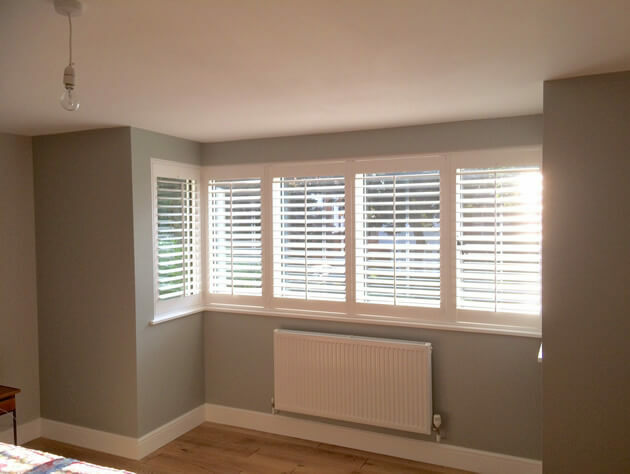 The shutters were finished in white with matching white hinges matching the radiator and skirting boards, while also becoming a focal point of the room against the green wall paint. 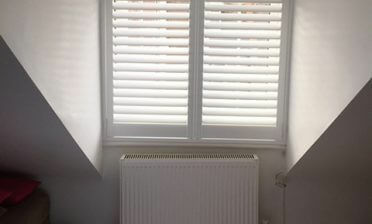 These shutters have made a fantastic addition to this bay window and will help the owners regulate lighting and airflow into the child’s bedroom!